The victorious Posh Deaf Under 13 team. From the left are, back, Joe Treacey, John Martins (Coach), Daniel Monaf, front, William Barnsley, Finley McEwan, Alex Hannan and Simao Martins. Both the Posh Under 13 and Under 16 teams reached the final in their respective age groups at the DW Sport Soccerdome at Pride Park with the Under 13s winning the trophy for the second time in three years. Posh Deaf Under 16s are from the left, back, Harry Jacobs, Joe Clark, Eddie Phillips, front, Lewis Andrews, David Shepperson and Ava Oske. 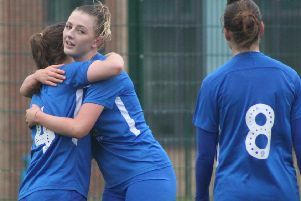 They beat opposition from all over the country, including sides from Charlton Athletic, Newcastle United, Derby County and Leeds. In the final they beat Charlton 2-0 with goals from Alex Hannan and Simao Martins. The Under 16s lost to Charlton 1-0 in their final.